The acclaimed PBS Kids show, based on John M. Feierabend's First Steps in Music series, breaks new ground for its great songs, engaging story, and educational content. 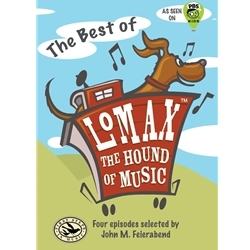 Meet the dog, Lomax, his cat friend Delta, their human Amy, and fleas Louise and Clark as they make music, laugh, and together seek out and sing new folk songs while traveling the American landscape in their train-caboose home. These four episodes were personally selected by John M. Feierabend and they are full of moments of quiet wonder, integrating all the elements of his acclaimed music education curriculum. Perfect for children in preschool and early elementary school.